The Barn's intern, Kori Bull, is taking over the blog today, and I'm so thrilled to have a guest blogger! I loved reading about this topic from the perspective of someone who's on site for every wedding, interacting with every single bride. Kori nailed it on this post about what brides should remember on their wedding day. 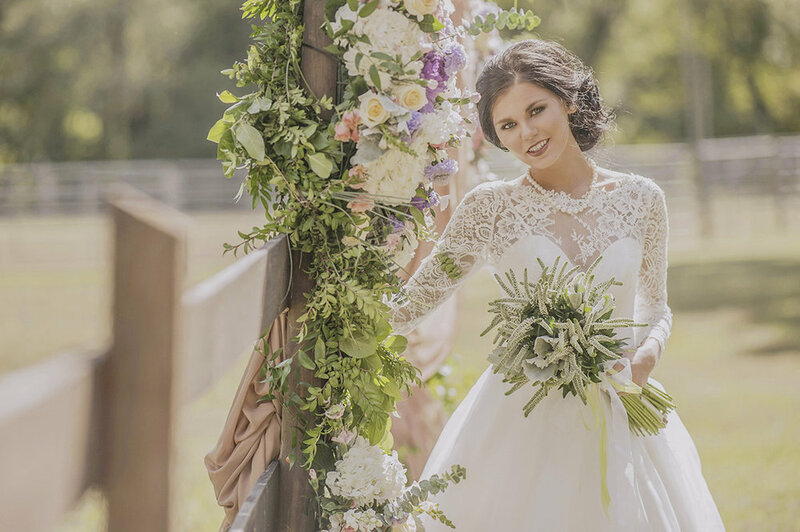 As an intern at The Barn at Twin Oaks Ranch, I have seen nearly every type of bride. From the traditional perfectionist to the contemporary and casual brides, every lady in white has a million last minute thoughts. Interns here also carry the title of "bridal concierge," or semi-pro boutonnierre and bustle pinner, veil adjuster, train carrier, and bridal pep talker. As I met more and more brides, I realized how similar many of them are. Every love story was unique, each dress carried its own stunning beauty, and all of the brides had a glow all of their own. What was distracting the brides was what unified them. I hate to see brides being absolutely anything but completely caught up in their own fairytale... so, brides, please think of only the happiest thoughts before taking the walk down the aisle and remember these things! "Big” things are only big pre-wedding day. Of course, if all you have wanted since the age of 5 is an egg-shell and pure gold wedding, girl get after it. Ask for exactly what you want, it’s your day. You’re probably paying us (the planners) to know our colors, I understand. If your roses are a smidge too egg-shell, pushing a light yellow, chill. Sometimes things like this are far out of your planner’s control. Your beau is still going to marry you, focus on the goal here. Little things are everything. I pray each bride has the liberty to be able to really soak in her wedding day and each tiny exhilarating moment it entails. Seriously ladies, there are so many little things to watch, try not to micromanage them. The flower girl stops mid-aisle to greet guests? Super, she’s the life of the party. Love them for the memories they are making, even if they weren’t on your Pinterest boards. You're not the only one. Whatever little thought is bouncing around in your head, be it "are the guests going to have fun? ", "am I going to trip in these shoes? ", or "okay, does he LIKE me like me or was he just being nice when he proposed to me?" you're not the only one that thinks it! Every bride gets a little scared before walking down the aisle. Please, don't let fear be the preeminent emotion in one of the happiest moments of your life. You're walking to the love of your life! You both have the best lookin' dates to this party. Everyone here either (a) loves you because they have to, it's your day or (b) truly loves and supports you. Even if you trip, we're all here to help you up. It also makes for a really great story a few years from now. Love your guests of honor. Seriously, watching other girls hiss at their mommas, fathers, or grandpappies made me regret 90% of my high school attitude towards my parents. No one looks good being mean to the ones that are (generally) working really hard by providing financial or any other support so your day is how you want it. If you think its awkward seeing a kid get in trouble, try watching a parent get in trouble. Remember that everyone is trying. Another thing that hurt my heart was that a lot of families are really broken. A rather shocking amount of brides and grooms don’t know if their immediate family is coming to the wedding at all. Having a guest there for you, wholeheartedly, can be considered a luxury. If you’re thinking about ever yelling at whoever is walking you down the aisle for wearing their favorite shoes, stop it. If their shoes are ruining your wedding, your wedding isn't too great to begin with. Remember why you're here. It isn't to impress Cynthia from your office, or to please your parents, or the fact that all of your friends are married besides you. You're here because the most brilliant, made for you, once in a lifetime type of love came your way and you're not going to let it get away. You're here to celebrate the moments you saw your future with your love and every fight you gave up (or won) in between. You're here to start the celebration that is the rest of your life with the person at the end of the aisle. From the start of the day to the champagne pop to hanging the dress up, consciously partake in each moment. It is one of the biggest, most extravagant days completely focused on you and your soon-to-be spouse! Your friends and little ones (maybe even their kids) are going to ask about this day, make sure your first newlywed stories are full of love and undistracted bliss.